The truest measure of genius is whether a person’s work resonates through the ages. At the Galleria dell’Accademia in Florence, Italy, Michelangelo’s “David” towers over admiring visitors more than 500 years after the artist carved the 17-foot-tall statue from a single block of marble discarded by other sculptors. Some minds are so exceptional they change the world. We don’t know exactly why these people soar above the rest of us, but science offers us clues. The Mütter Museum in Philadelphia houses an array of singular medical specimens. On the lower level the fused livers of 19th-century conjoined twins Chang and Eng float in a glass vessel. Nearby, visitors can gawk at hands swollen with gout, the bladder stones of Chief Justice John Marshall, the cancerous tumor extracted from President Grover Cleveland’s jaw, and a thighbone from a Civil War soldier with the wounding bullet still in place. But there’s one exhibit near the entrance that elicits unmatchable awe. Look closely at the display, and you can see smudge marks left by museumgoers pressing their foreheads against the glass. Throughout history rare individuals have stood out for their meteoric contributions to a field. Lady Murasaki for her literary inventiveness. Michelangelo for his masterful touch. Marie Curie for her scientific acuity. “The genius,” wrote German philosopher Arthur Schopenhauer, “lights on his age like a comet into the paths of the planets.” Consider Einstein’s impact on physics. With no tools at his disposal other than the force of his own thoughts, he predicted in his general theory of relativity that massive accelerating objects—like black holes orbiting each other—would create ripples in the fabric of space-time. It took one hundred years, enormous computational power, and massively sophisticated technology to definitively prove him right, with the physical detection of such gravitational waves less than two years ago. Einstein revolutionized our understanding of the very laws of the universe. But our understanding of how a mind like his works remains stubbornly earthbound. What set his brainpower, his thought processes, apart from those of his merely brilliant peers? What makes a genius? A century after Einstein predicted the existence of gravitational waves—ripples in the fabric of space-time— in his general theory of relativity, scientists like Kazuhiro Yamamoto (on bicycle) plan to use the first underground gravitational wave telescope, KAGRA, in Hida, Japan, to explore what he deduced but could not detect. Philosophers have long been pondering the origins of genius. Early Greek thinkers believed an overabundance of black bile—one of the four bodily humors proposed by Hippocrates—endowed poets, philosophers, and other eminent souls with “exalted powers,” says historian Darrin McMahon, author of Divine Fury: A History of Genius. Phrenologists attempted to find genius in bumps on the head; craniometrists collected skulls—including philosopher Immanuel Kant’s—which they probed, measured, and weighed. None of them discovered a single source of genius, and such a thing is unlikely to be found. Genius is too elusive, too subjective, too wedded to the verdict of history to be easily identified. And it requires the ultimate expression of too many traits to be simplified into the highest point on one human scale. Instead we can try to understand it by unraveling the complex and tangled qualities—intelligence, creativity, perseverance, and simple good fortune, to name a few—that entwine to create a person capable of changing the world. Intelligence has often been considered the default yardstick of genius—a measurable quality generating tremendous accomplishment. Lewis Terman, the Stanford University psychologist who helped pioneer the IQ test, believed a test that captured intelligence would also reveal genius. In the 1920s he began tracking more than 1,500 Californian schoolkids with IQs generally above 140—a threshold he labeled as “near genius or genius”—to see how they fared in life and how they compared with other children. Terman and his collaborators followed the participants, nicknamed “Termites,” for their lifetimes and mapped their successes in a series of reports, Genetic Studies of Genius. The group included members of the National Academy of Sciences, politicians, doctors, professors, and musicians. Forty years after the study began, the researchers documented the thousands of academic reports and books they published, as well as the number of patents granted (350) and short stories written (about 400). But monumental intelligence on its own is no guarantee of monumental achievement, as Terman and his collaborators would discover. A number of the study’s participants struggled to thrive, despite their towering IQ scores. Several dozen flunked out of college at first. Others, tested for the study but with IQs that weren’t high enough to make the cut, grew up to become renowned in their fields, most famously Luis Alvarez and William Shockley, both of whom won Nobel Prizes in physics. There’s precedent for such underestimation: Charles Darwin recalled being considered “a very ordinary boy, rather below the common standard in intellect.” As an adult he solved the mystery of how the splendid diversity of life came into being. Unexpected flashes of insight still require some thought. After seeing an apple fall perpendicularly to the ground in 1666, Isaac Newton reasoned that, in a friend’s telling, “there must be a drawing power in matter.” The tree that sparked his law of gravity remains rooted next to his childhood home at Woolsthorpe Manor, England. Scientific breakthroughs like Darwin’s theory of evolution by natural selection would be impossible without creativity, a strand of genius that Terman couldn’t measure. But creativity and its processes can be explained, to a certain extent, by creative people themselves. Scott Barry Kaufman, scientific director of the Imagination Institute in Philadelphia, has been bringing together individuals who stand out as trailblazers in their fields—people like psychologist Steven Pinker and comedian Anne Libera of the Second City—to talk about how their ideas and insights are kindled. Kaufman’s goal is not to elucidate genius—he considers the word to be a societal judgment that elevates a chosen few while overlooking others—but to nurture imagination in everyone. These discussions have revealed that the aha moment, the flash of clarity that arises at unexpected times—in a dream, in the shower, on a walk—often emerges after a period of contemplation. Information comes in consciously, but the problem is processed unconsciously, the resulting solution leaping out when the mind least expects it. “Great ideas don’t tend to come when you’re narrowly focusing on them,” says Kaufman. Studies of the brain offer hints at how these aha moments might happen. The creative process, says Rex Jung, a neuroscientist at the University of New Mexico, relies on the dynamic interplay of neural networks operating in concert and drawing from different parts of the brain at once—both the right and left hemispheres and especially regions in the prefrontal cortex. One of these networks fosters our ability to meet external demands—activities we must act on, like going to work and paying our taxes—and resides largely in outer areas of the brain. The other cultivates internal thought processes, including daydreaming and imagining, and stretches mainly across the brain’s middle region. Prodigious productivity is a defining characteristic of genius. Charcoal sketches cover the walls of a once concealed room beneath the Medici Chapel in Florence, where Michelangelo hid for three months in 1530 after defying his patrons. The drawings include a sketch of a seated figure (right) who appears on a tomb in the chapel above. Jazz improvisation provides a compelling example of how neural networks interact during the creative process. Charles Limb, a hearing specialist and auditory surgeon at UC San Francisco, designed an iron-free keyboard small enough to be played inside the confines of an MRI scanner. Six jazz pianists were asked to play a scale and a piece of memorized music and then to improvise solos as they listened to the sounds of a jazz quartet. Their scans demonstrate that brain activity was “fundamentally different” while the musicians were improvising, says Limb. The internal network, associated with self-expression, showed increased activity, while the outer network, linked to focused attention and also self-censoring, quieted down. “It’s almost as if the brain turned off its own ability to criticize itself,” he says. This may help explain the astounding performances of jazz pianist Keith Jarrett. Jarrett, who improvises concerts that last for as long as two hours, finds it difficult—impossible, actually—to explain how his music takes shape. But when he sits down in front of audiences, he purposefully pushes notes out of his mind, moving his hands to keys he had no intention of playing. “I’m bypassing the brain completely,” he tells me. “I am being pulled by a force that I can only be thankful for.” Jarrett specifically remembers one concert in Munich, where he felt as if he had disappeared into the high notes of the keyboard. His creative artistry, nurtured by decades of listening, learning, and practicing melodies, emerges when he is least in control. “It’s a vast space in which I trust there will be music,” he says. One sign of creativity is being able to make connections between seemingly disparate concepts. Richer communication between areas of the brain may help make those intuitive leaps possible. Andrew Newberg, director of research at the Marcus Institute of Integrative Health at Thomas Jefferson University Hospitals, is using diffusion tensor imaging, an MRI contrast technique, to map neural pathways in the brains of creative people. His participants, who come from Kaufman’s pool of big thinkers, are given standard creativity tests, which ask them to come up with novel uses for everyday objects like baseball bats and toothbrushes. Newberg aims to compare the connectivity in the brains of these high achievers against that of a group of controls to see if there is a difference in how effectively the various regions of their brains interact. His ultimate goal is to scan as many as 25 in each category and then pool the data so he can look for similarities within each group as well as differences that may appear across vocations. For instance, are certain areas more active in a comedian’s brain compared with a psychologist’s? A preliminary comparison of one “genius”—Newberg uses the word loosely to distinguish the two groups of participants—and one control reveals an intriguing contrast. On the subjects’ brain scans, swaths of red, green, and blue illuminate tracts of white matter, which contain the wiring that allows neurons to transmit electrical messages. The red blotch on each image is the corpus callosum, a centrally located bundle of more than 200 million nerve fibers that joins the two hemispheres of the brain and facilitates connectivity between them. “The more red you see,” Newberg says, “the more connecting fibers there are.” The difference is notable: The red section of the “genius” brain appears to be about twice as wide as the red of the control brain. Stephen Wiltshire, a British artist with autism, created an exquisitely accurate panorama of Mexico City after one afternoon’s viewing and five days of drawing. Psychiatrist Darold Treffert believes that unique wiring between the brain’s right and left hemispheres allows people like Wiltshire to access reserves of creativity. Watch Wiltshire draw an entire city from memory. Advances in genetic research now make it possible to examine human traits at the molecular level. Over the past several decades, scientists have been searching for genes that contribute to intelligence, behavior, and even unique qualities like perfect pitch. In the case of intelligence, this research triggers ethical concerns about how it might be used; it is also exceedingly complex, as thousands of genes may be involved—each one with a very small effect. What about other kinds of abilities? Is there something innate in having an ear for music? Numerous accomplished musicians, including Mozart and Ella Fitzgerald, are believed to have had perfect pitch, which may have played a role in their extraordinary careers. Genetic potential alone does not predict actual accomplishment. It also takes nurture to grow a genius. Social and cultural influences can provide that nourishment, creating clusters of genius at moments and places in history: Baghdad during Islam’s Golden Age, Kolkata during the Bengal Renaissance, Silicon Valley today. older than grand opera’s peak age range. declining health and motivation as we age. discipline, and how soon you master it. swamp the impact of age,” wrote Simonton. 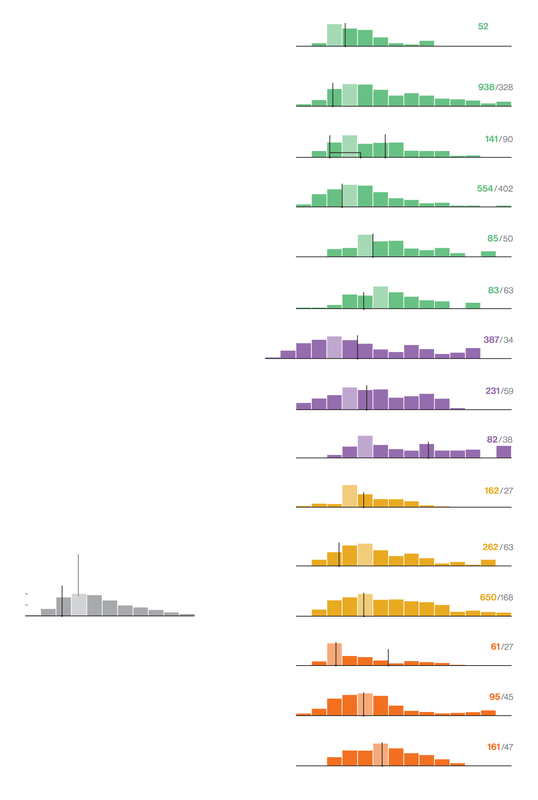 rates as percentages of peak output. as percentages of peak output. for Isaac Newton and Michelangelo. 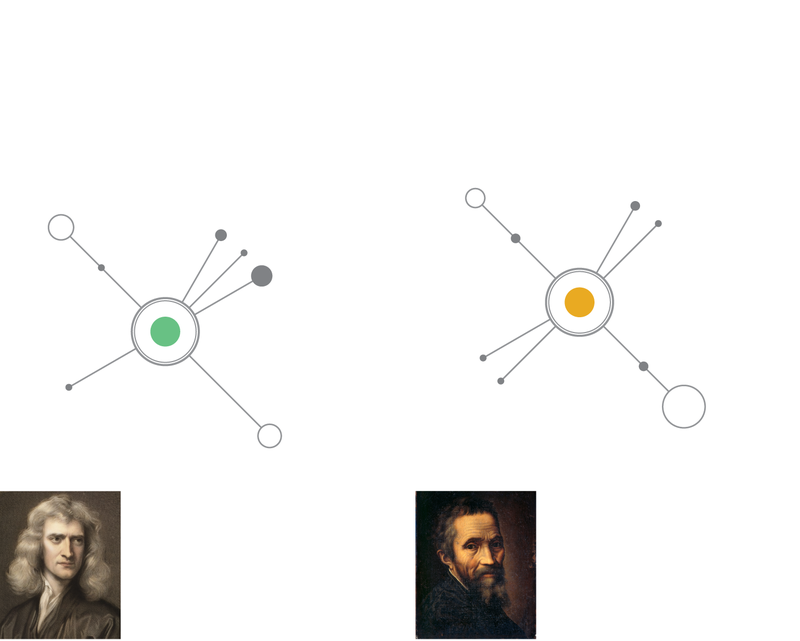 field created within a web of connections, as shown below for Isaac Newton and Michelangelo. greatest art—and its deepest pockets. Nor does it happen on the first try. “The number one predictor of impact is productivity,” says Dean Keith Simonton, professor emeritus of psychology at UC Davis and a longtime scholar of genius. Big hits emerge after many attempts. “Most articles published in the sciences are never cited by anybody,” says Simonton. “Most compositions are not recorded. Most works of art aren’t displayed.” Thomas Edison invented the phonograph and the first commercially viable light bulb, but these were just two of the thousand-plus U.S. patents he was awarded. An fMRI brain scan illustrates brain activity during improvisation. Sometimes, by sheer good fortune, promise and opportunity collide. If there were ever an individual who personified the concept of genius in every aspect, from its ingredients to its far-reaching impact, it would be Leonardo da Vinci. Born in 1452 to unmarried parents, Leonardo began life in a stone farmhouse in Italy’s Tuscan hills, where olive trees and dusky blue clouds blanket the Arno Valley. From these simple beginnings, Leonardo’s intellect and artistry soared like Schopenhauer’s comet. The breadth of his abilities—his artistic insights, his expertise in human anatomy, his prescient engineering—is unparalleled. Leonardo’s pathway to genius began with an apprenticeship with master artist Andrea del Verrocchio in Florence when he was a teenager. Leonardo’s creativity was so robust that in his lifetime he filled thousands of pages in his notebooks, which brimmed with studies and designs, from the science of optics to his famed inventions, including a revolving bridge and a flying machine. He persisted no matter the challenge. “Obstacles cannot crush me,” he wrote. “He who is fixed to a star does not change his mind.” Leonardo also lived in a place (Florence) and at a time (the Italian Renaissance) when the arts were cultivated by wealthy patrons and inventiveness coursed through the streets, where great minds, including Michelangelo and Raphael, jostled for acclaim. Leonardo delighted in envisioning the impossible—hitting a target that, as Schopenhauer wrote, “others cannot even see.” Today an international group of scholars and scientists has taken on a similar mission, and its subject is just as elusive: Leonardo himself. The Leonardo Project is tracing the artist’s genealogy and hunting down his DNA to learn more about his ancestry and physical characteristics, to verify paintings that have been attributed to him—and, most remarkably, to search for clues to his extraordinary talent. Team member David Caramelli’s high-tech molecular anthropology lab at the University of Florence sits in a 16th-century building with a glorious view of the Florentine skyline. Jutting out majestically is the dome of the city’s prominent cathedral, Santa Maria del Fiore, whose original crowning copper-gilt ball was made by Verrocchio and raised to the top of the cupola with Leonardo’s help in 1471. This juxtaposition of past and present is a fitting setting for Caramelli’s expertise in ancient DNA. Two years ago he published preliminary genetic analyses of a Neanderthal skeleton. Now he is poised to apply similar techniques to Leonardo’s DNA, which the team is hoping to extract from some form of biological relic—the artist’s bones, a strand of hair, skin cells left behind on his paintings or notebooks, or perhaps even saliva, which Leonardo may have used to prepare canvases for his silverpoint drawings. Throughout history bright minds have flocked to nexuses of creativity like Silicon Valley, where Wenzhao Lian, a researcher at Vicarious, an artificial intelligence company, teaches a robot how to recognize and manipulate objects. The company aims to develop programs that mimic the brain’s capacity for vision, language, and motor control. It is an ambitious plan, but team members are optimistically laying the groundwork. Genealogists are tracking down Leonardo’s living relatives on his father’s side for cheek swabs, which Caramelli will use to identify a genetic marker to confirm the authenticity of Leonardo’s DNA if it is found. Physical anthropologists are seeking access to remains that are believed to be Leonardo’s at Amboise castle in France’s Loire Valley, where he was buried in 1519. Art historians and geneticists, including specialists at the institute of genomics pioneer J. Craig Venter, are experimenting with techniques to obtain DNA from fragile Renaissance-era paintings and paper. “The wheels are starting to turn,” says Jesse Ausubel, vice chairman of the Richard Lounsbery Foundation and an environmental scientist at Rockefeller University in New York City, who is coordinating the project. One of the group’s early goals is to explore the possibility that Leonardo’s genius stemmed not only from his intellect, creativity, and cultured environment but also from his exemplary powers of perception. “In the same way that Mozart may have had extraordinary hearing,” says Ausubel, “Leonardo appears to have had extraordinary visual acuity.” Some of the genetic components of vision are well identified, including the red and green color-vision pigment genes, located on the X chromosome. Thomas Sakmar, a specialist in sensory neuroscience at Rockefeller, says it’s conceivable that scientists could explore those regions of the genome to see if Leonardo had any unique variations that changed his color palette, allowing him to see more hues of red or green than most people are able to perceive. The Leonardo Project team doesn’t yet know where to look for answers to other questions, such as how to explain Leonardo’s remarkable ability to visualize birds in flight. “It’s as if he was creating stroboscopic photographs of stop-action,” says Sakmar. “It’s not far-fetched that there would be genes related to that ability.” He and his colleagues view their work as the beginning of an expedition that will lead them down new pathways as DNA gives up its secrets. The quest to unravel the origins of genius may never reach an end point. Like the universe, its mysteries will continue to challenge us, even as we reach for the stars. For some, that is as it should be. “I don’t want to figure it out at all,” says Keith Jarrett when I ask if he is comfortable not knowing how his music takes hold. “If someone offered me the answer, I’d say, Take it away.” In the end it may be that the journey is illuminating enough and that the insights it reveals along the way—about the brain, about our genes, about the way we think—will nurture glimmers of genius in not just the rare individual but in us all. To learn more about Albert Einstein, tune in to National Geographic’s 10-part series Genius, which airs Tuesdays starting April 25. Claudia Kalb wrote Andy Warhol Was a Hoarder: Inside the Minds of History’s Great Personalities for National Geographic Books. Photographer Paolo Woods lives in Florence, Italy. This is his first story for the magazine. Find out if you could be related to a genius with the new Geno 2.0 kit, available at genographic.com/genius.